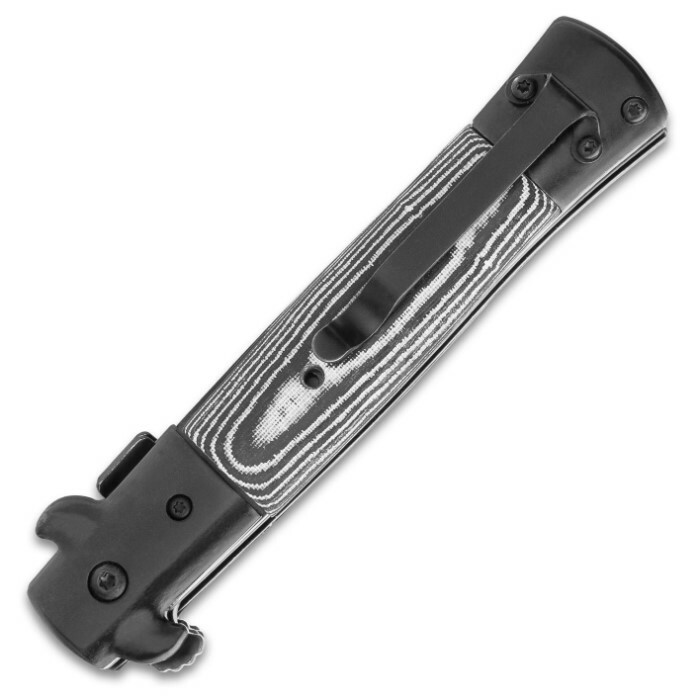 Black Micarta Handle Assisted Opening Stiletto | BUDK.com - Knives & Swords At The Lowest Prices! Reminiscent of the knives of the 1950s gangsters, this stiletto is the perfect gentleman's knife! The lightning-fast assisted opening mechanism will leave you astonished when you use it to access the razor sharp 3 3/4" AUS-6 stainless steel blade. 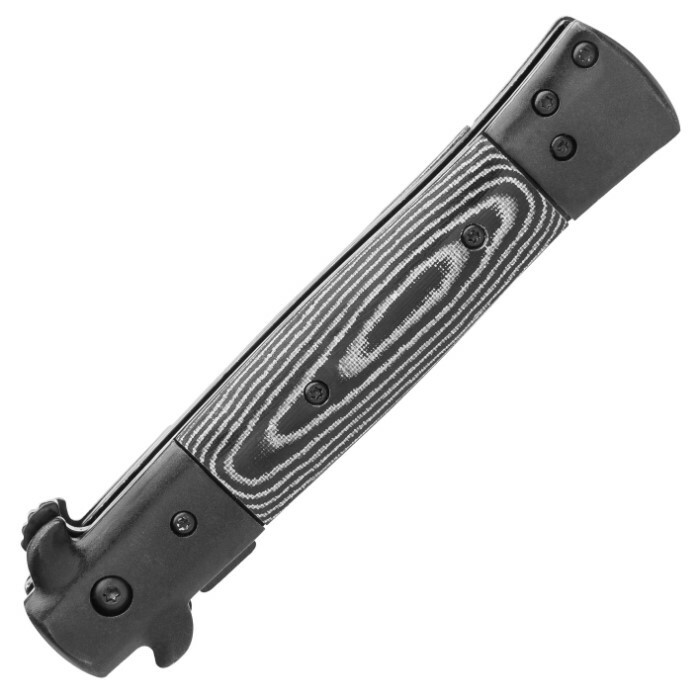 The knife has a premium black Micarta handle and black stainless steel bolsters and pocket clip. The stiletto is 8 3/4" in overall length. Very fast opening. Excellent micarta handle. Very cool black blade. Good purchase. Just what I was looking for in a stiletto. Good knife. I had mine for about a year or so, and I plan on buying again. I took it around everywhere and it didn't have many problems, but the screws did get loose after awhile from lots of opening and closing. I just made a trip to Home Depot and bought a small, affordable case of screwdriver tips. The sizes are T8 and T6, I believe. Mine finally broke because I accidentally tightened it too much, and it wouldn't flick open. When I loosened it I did it too much so some of the screws started to fall out, and I lost a few pieces. In conclusion, the knife itself is really good, just make sure you're careful about how you handle it. Got this Micarta knife a week ago! Solid body, nice and heavy---but wieldy! I haven't tried sharpening it yet, because it seems sharp enough for now. I dig the old school gangster-style look! You might wanna loosen in and oil the mechanism a bit to make it easier to flick open. I messed a bit with the blade on the locking area, bu Dremel-grinding a bit off for the lock to bite deeper, now it has a bit of play, but it is still a good knife for the surprisingly low price . I love BudK knives and have like 17 of them now. Enjoy! This is a fantastic knife blade holds edge very well. 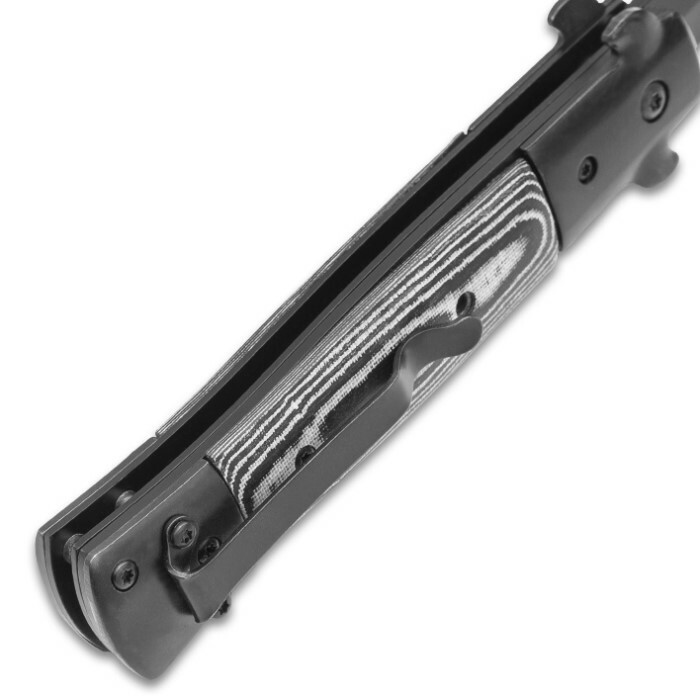 Is a heavy knife that opens well with the assist and feels like a heavy high quality knife. Will be a great carry knife for anybody and well worth the price. Very satisfied and would definitely recommend to my friends and suggest giving it as a great Christmas Present. This is a fantastic knife for the price, a solid similar heavy knife but good solid grip and excellent pointed one sided blade. 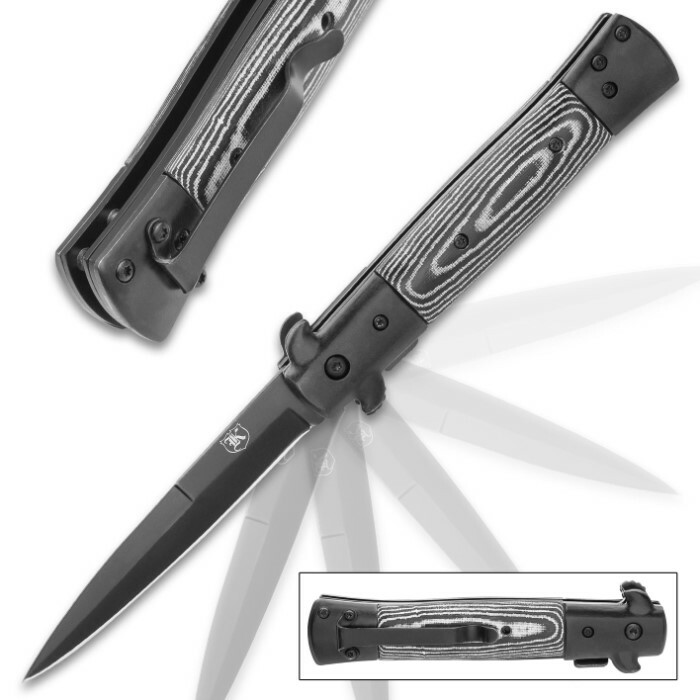 Sharp and classy looking, I have bought two and ordered one for a friend in Arizona and decided to order a 3rd one for me. This is how much I think of this knife ??. I like it a lot. Opens fast, works well with either hand and has a good edge. Only sharp on one side so it is not like a spear point knife. I'm looking for another about the same size with a spear point but after reading reviews ones that look good seem to have hit or miss quality control. This one came out perfectly.